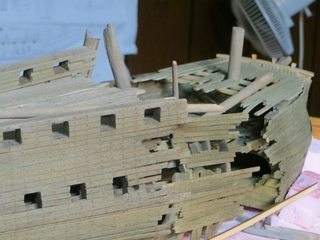 Here is one of the last pics of the stern section. I will try some larger pics next time. 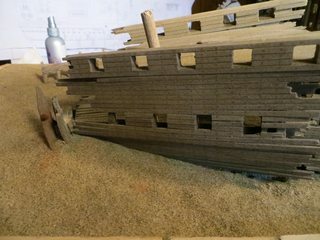 The "Fantasy" was always a goal of mine to build a handmade ship, no machine tools etc..Scrathbuilt today has no meaning anymore as there are varying degrees of the term now.I prefer the term handbuilt like the builders of the old times. "Fantasy" is like a modern piece of folk art. Really starting to shape up John. Like the detail you've added so far to the stern section. Really helps set the scene. I will be finishing it in the spring.Thanks Winston. Will be adding other pics soon.I figure that I can do two things at once both ship building and airplanes without having to give up either one.Cheers ! John.